Who doesn’t love comfort food— those homey, no-frills dishes that can lift you up after a crummy day. Fork-tender pot roast, piping hot macaroni and cheese, a steaming bowl of chili— these dishes conjure up grandma’s kitchen, where everything was made with care, from the best ingredients. 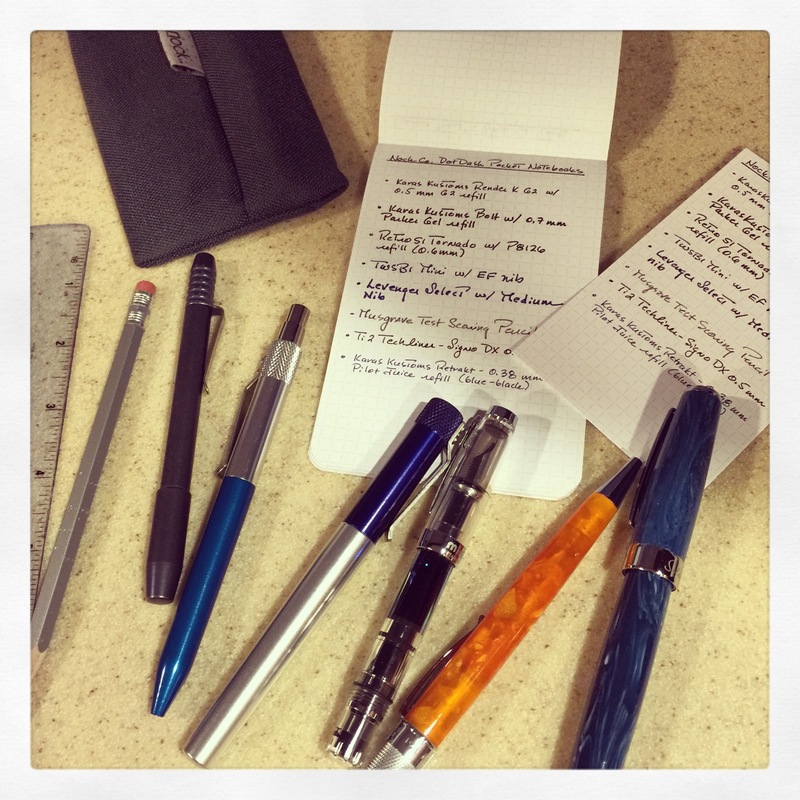 Seems to me, my Nock Co. favorites are the pen world’s equivalent of comfort food. Made by people who care, Nock Co. designs and products are classic— made to stand the test of time. Without a hint of pretentiousness, these are goods that can handle what life throws at you, and bring a little joy to even your most frustrating day. The DotDash Pocket Notebook is top-stapled, measures 3.5″ x 5.5″, and can be used in portrait or landscape mode. I’ve recently started using mine to sketch out quick blog post outlines. 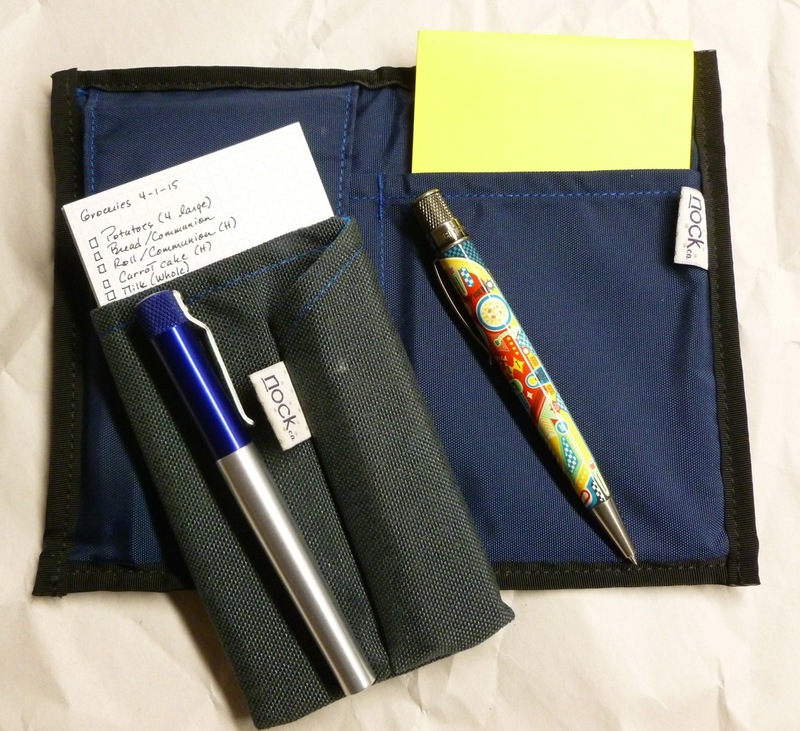 Since it’s hard to know when an idea may strike, I carry mine tucked inside a Nock Co. Hightower case, along with a healthy selection of pens. I’m fully prepared for when the blog muse strikes. 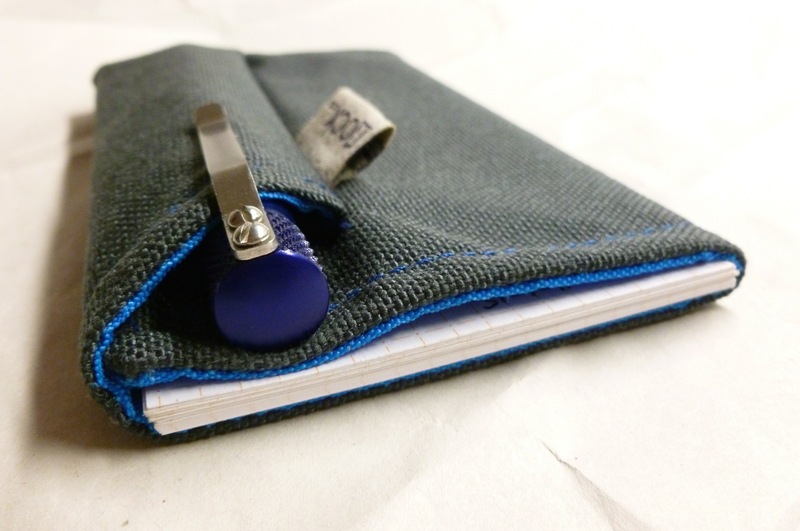 The Nock Co. Pocket Notebook contains forty-eight 50 lb. pages, printed front and back with a Cool Gray DotDash pattern that just so happens to be my preferred format. The DotDash “grid” is dark enough to provide guidance for your writing, without being too dark and getting in the way. 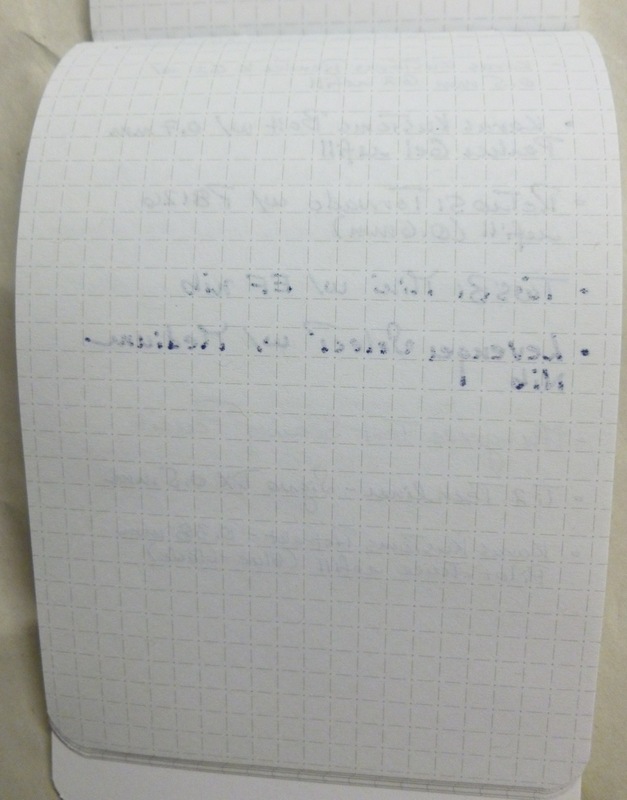 Gel inks fare very well on the page, while fountain pen inks show a bit of feathering, and do result in a little bit of bleed-through. 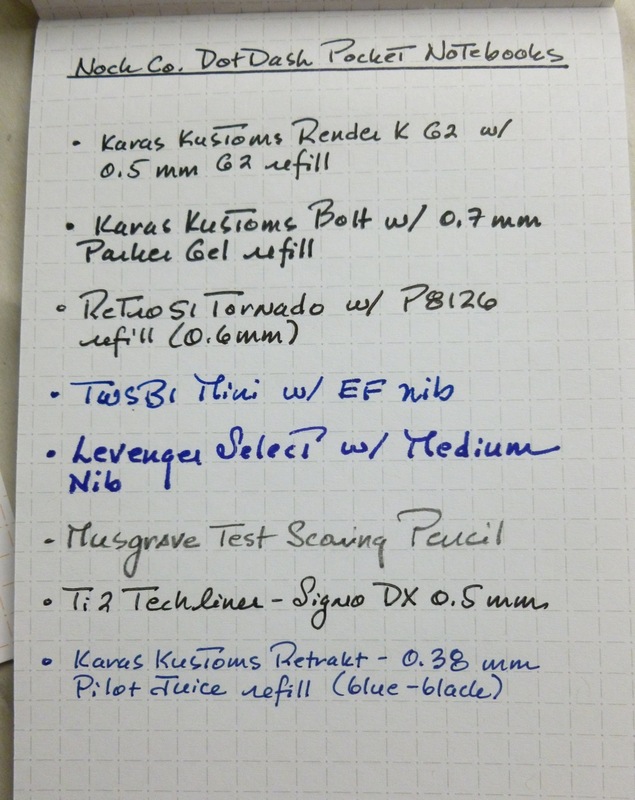 I prefer using my Retro 51s, Karas Kustoms pens, and Ti2 Techliner in this notebook as these inks remain sharp and dry quickly. 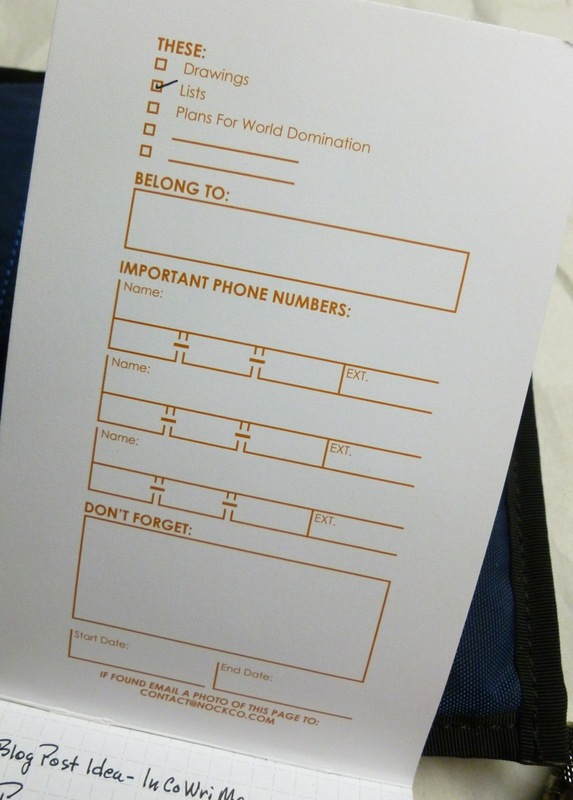 Fill out the information inside the front cover of your notebook just in case you misplace it. Not that I’d do such a thing (says the woman who keeps LEAVING HER PURSE at Dunkin Donuts—GAH!). 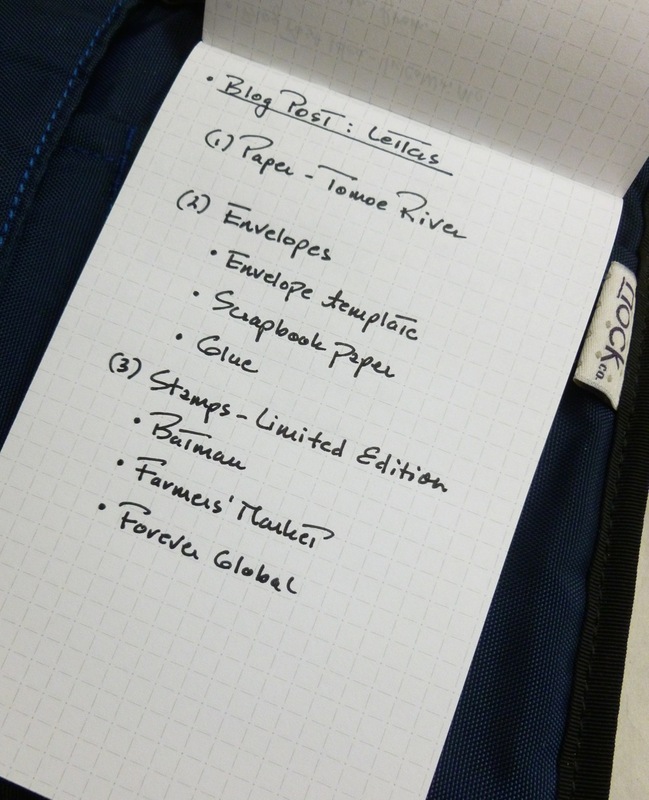 The Nock Co. DotDash Notecards have been a staple in my analog tools daily carry since their release. Tucked inside a Fodderstack, along with the special-edition Nock Co./Karas Kustoms Render K, this is a combination that goes with me EVERYWHERE. 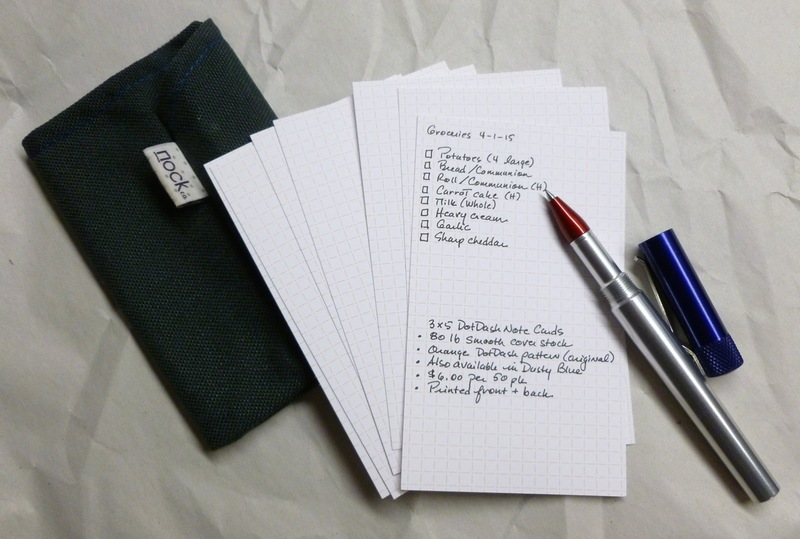 I jot down directions, make weekly grocery lists, plan menus, and capture to-do list items. I’m never without my Nock Co. Fodderstack, Render K, and notecards. Made from 80 lb. 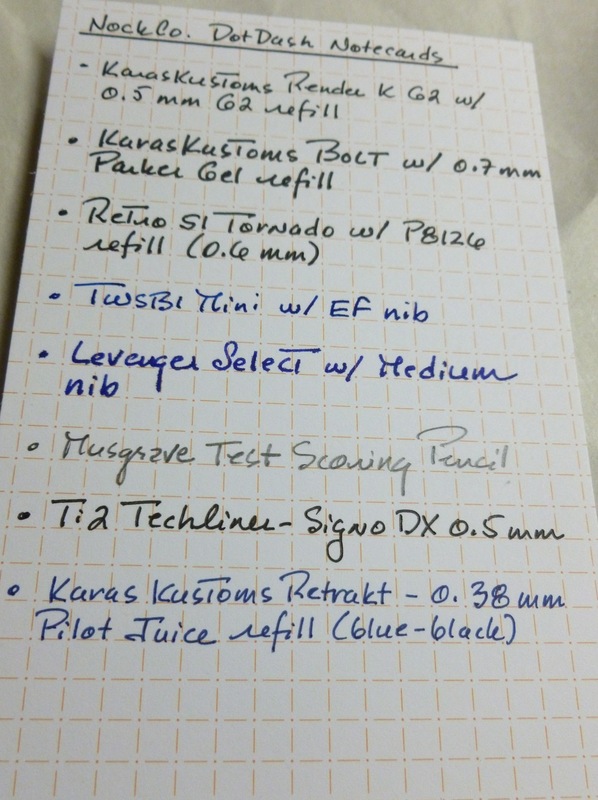 smooth cover stock, the notecards handle even fountain pen ink quite well, though, again, I’m generally using some sort of 0.5 mm gel pen refill. The DotDash pattern on the notecards comes in Orange or Dusty Blue— colors that don’t look too busy or bright. 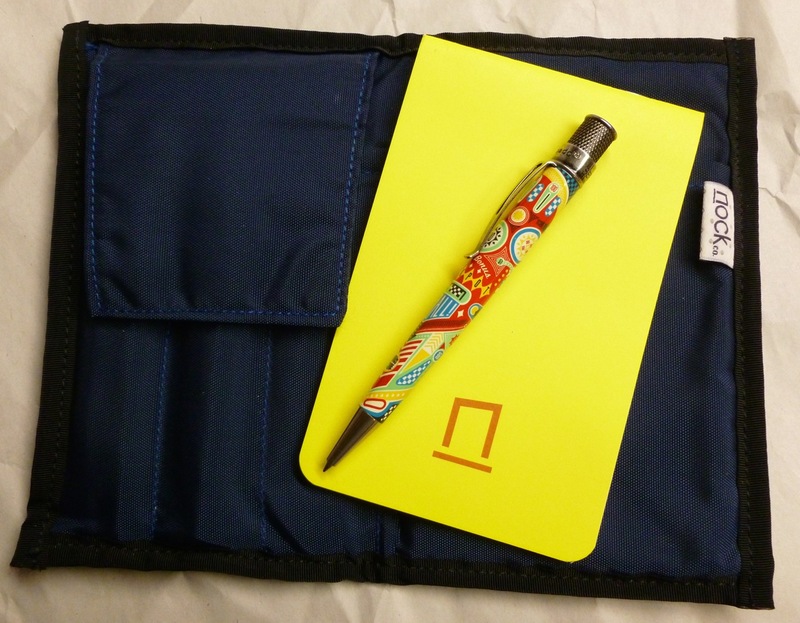 Nock Co. cases, Pocket Notebooks, and Notecards are well-made goods that come without fuss or hassle. They work. They last. They’re 100% reliable. And like grandma’s warm apple pie, they keep you coming back for more. 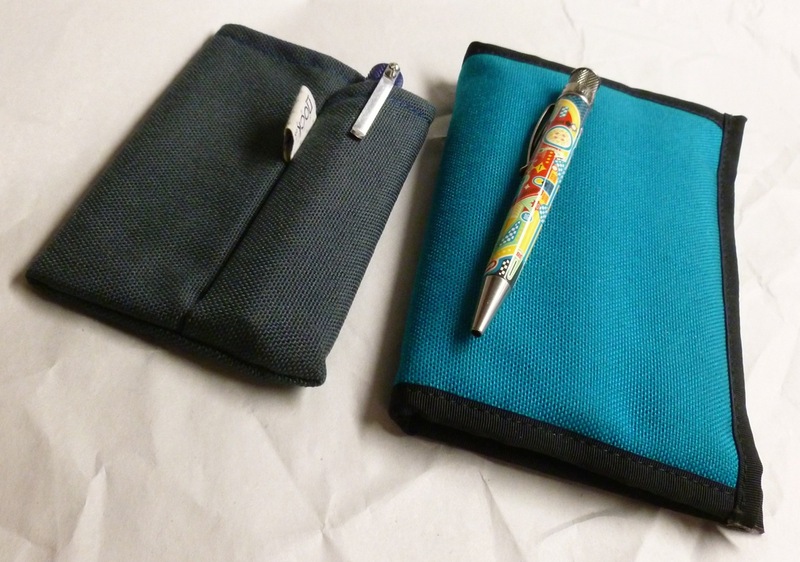 The Nock Co. Pocket Notebooks were sent to me for review purposes. All other products were purchased by me, either during the Nock Co. Kickstarter campaign, or from the Nock Co. online store. There are no affiliate links in this post, and I was not monetarily compensated for this review.